Preface: My interest in the art of mime began when I first saw Marcel Carné's film Les Enfants du Paradis (Children of Paradise), a 1945 film at Cornell on January 11, 1966. I jotted down seven quotes from the film in my "1966 Diary Book". One of the quote was "There are lovers who love without words, and they do it beautifully." This would become my all-time favorite film, because Jean-Louis Barrault as Baptiste the mime artist performed so beautifully, loving without words. 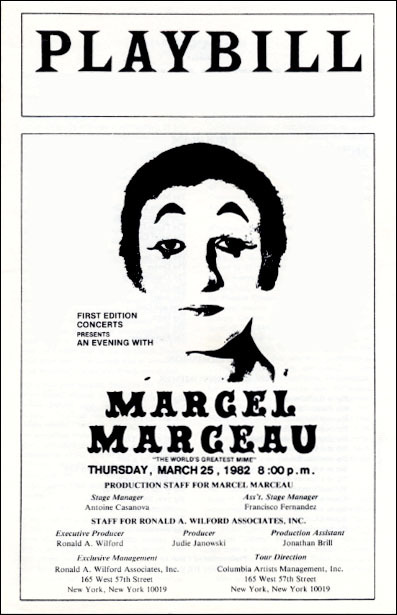 Upon learning that Marcel Marceau had studied with Étienne Decroux who had taught mime to Barrault, I went to see Marcel Marceau perform live on three occasions. The first was in New York (no program to recall the date & place). The second was at the Schubert Theatre at 265 Tremont Street in Boston (April 20, 1974). The third was at Mechanics Hall in Worcester, Massachusetts (March 25, 1982). When I learned that Marcel Marceau died at age 84 on September 22, 2007, it brought a flood of memories about his marvelous mime performances I had seen. 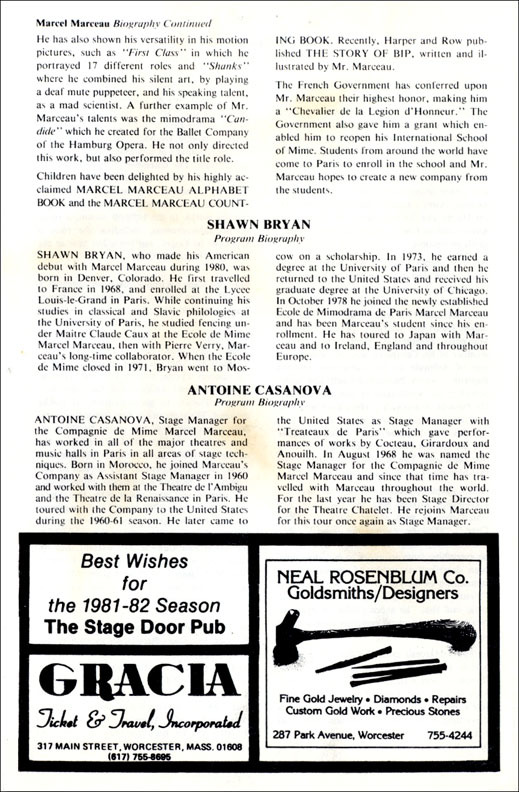 But most of all the wonderful meeting I had with him after his Boston matinee performance in 1974. I found the home-made card he had signed for me on that occasion among my voluminous papers and folders. I also located the wise words he shared with me which I had written afterwards in my Wilhelm-Baynes edition of the I Ching on page 196. After finding these momentos of Marcel Marceau, I wrote this poem on how he inspired my work to be mindful in poetry and science. In "Youth, Maturity, Old Age and Death", he depicted in four minutes the joy and pathos of life more succinctly and dramatically than many novelists & playwrights were able to do in hundreds of pages. He began folded into himself, an embryo, then strutted boldly, then crumpled and knotted himself into shrunken death. Marceau had learned the power of illusion on a sun drenched afternoon toward the end of World War II while fighting with the French Résistance. He and a companion had entered a clearing and suddenly found themselves face-to-face with a unit of German soldiers. Startled, Marceau acted as if he was the advance guard of a larger French force and demanded the German surrender. As Marcel related the incident, he suddenly sprang to his feet and struck a predatory pose. The night air filled with menace and, an instant later, triumph. Though it was well past midnight, I still see the helmets of the surrendering Germans glinting in that sunlight meadow. Marcel Marceau appeared on Johnny Carson's The Tonight Show on numerous occasions (1970-1979). The interview I saw occured sometime before 1974. 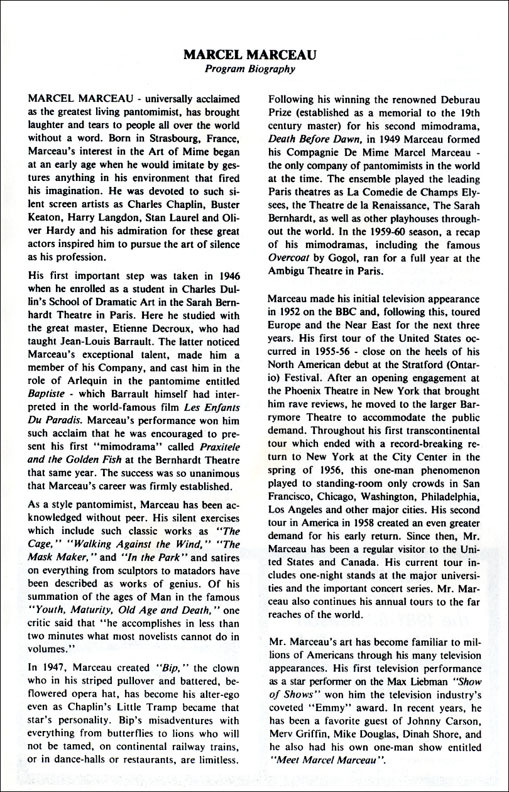 In his first North America tour (1955), Marceau played to acclaim for six weeks in Hollywood. Charles Laughton, Marlon Brando, Gary Cooper and the Marx Brothers came to see him. Harpo Marx, also a silent performer, became a friend. "The universe is very beautiful, yet it says nothing. Suddenly I blurt out "I'm an old friend too! and we go way back Chuang Tzu's the name"
When the guard told me that Marceau takes a nap and will not see any visitors, I was disappointed and was about to leave. Just then the French Consul-General and his wife came in and the guard allowed them in because they're old friends of Marceau. Because I had written out in my best calligraphy the Chuang Tzu quote on special rag paper and made a nice portrait card for Marceau to autograph, I didn't want to be turned away. Most of all, I was curious for Marceau to complete his story about Zen and mime which Johnny Carson never asked after the commercial break. So I suddenly invoked Chuang Tzu's name to the guard, saying I'm an old friend of Marceau, never telling him that this Taoist sage was from 4th century B.C. I was ecstatic when Marceau welcomed me in. I made this 7"x10" yellow card cutting out a Marcel Marceau portrait as Bip dancing from an earlier flyer. I cut out a blue circle with 3.875" diameter and placed this halo behind Bip's head. Since Bip is often portrayed as a sad character in Marceau's rendition of him, blue symbolizes a kind of sadness. But it also represents a giant blue balloon which Bip encounters in a park with children. Because Bip has his arms extended as if flying happily, blue could represent the expansive blue sky where the mind expands to infinity. Marcel loved my portrait card and began signing "to Chuang Tzu". When I told him my name is Peter, he covered "to" with "from" so it reads "from Chuang Tzu". Then he wrote "thank you for the wonderful quote". 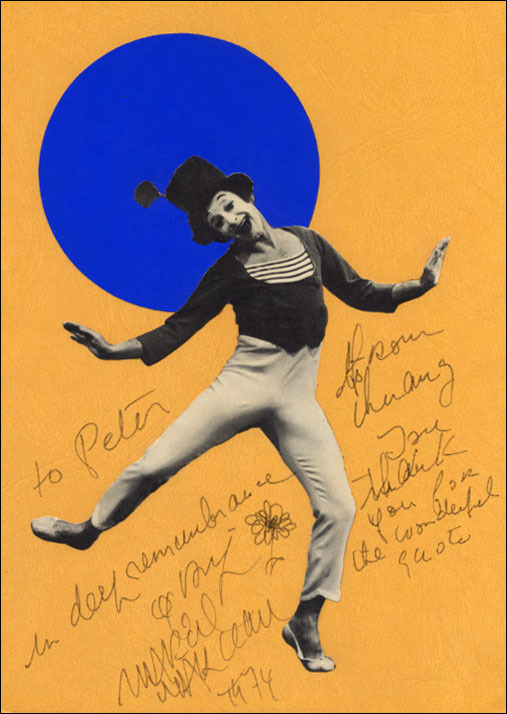 On the left side he signed "to Peter in deep remembrance of Bip, Marcel Marceau 1974", drawing the red carnation which Bip always wears on his stovepipe hat. "in deep remembrance of Bip"
Bip is the alter ego of Marcel Marceau. He created the on-stage persona in 1947. His name, Bip, came loosely from Charles Dickens's sad story of the orphan Pip in Great Expectations (1861). Bip's silence was a tribute to all those who died in the Auschwitz camps including Marceau's father in 1944. 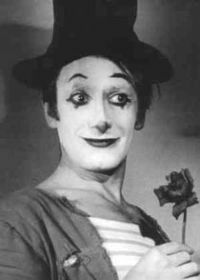 In one of his acts, "Bip Remembers", the sad-faced clown relived in mime the horrors of the war and stressed the necessity of love. 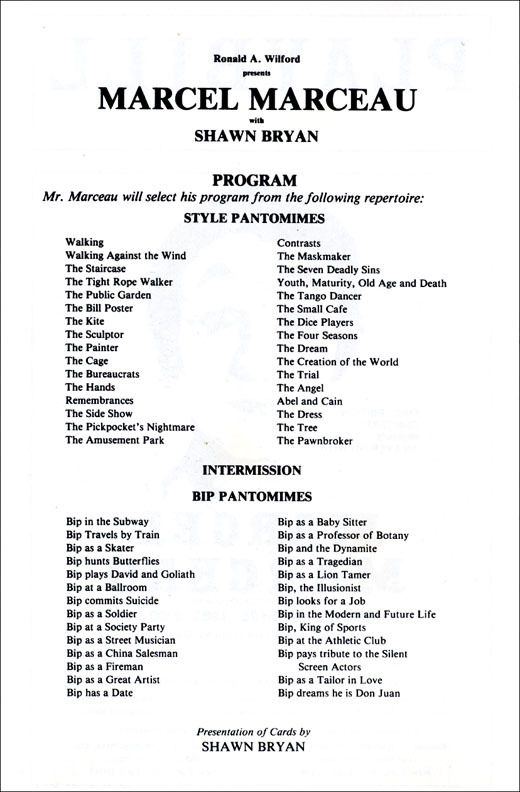 Marceau has 27 Bip Pantomimes in his repertoire. "My interest in Zen came after an inner experience through mime." which he didn't get a chance to elaborate on the Johnny Carson television show. Satori experience in Zen comes when one is deeply absorbed in meditation or being involved in one's work whether it's art or science. Archimedes had his revelation in the bathtub when he discovered specific gravity shouting "Eureka! Eureka!" ("I've found it! ") a method to detect impure gold coins. Paul Klee had his experience in Tunisia (April 16, 1914) when he discovered the root of all colors, and declared "Color and I are one. I am a painter." In our modern age of instant meals and everything, many practioners on the spiritual path want instant enlightenment. There are passages in Zen literature on "sudden awakening". However, a close reading reveals that those monks who experienced instant awakening had been meditating for years. If it takes a surgeon a dozen years to perfect his craft, why expect spiritual enlightenment to be so quick without effort or discipline. While true yogic practice takes time, the enlightenment experience itself is out of time, out of thinking, an intuitive grasp of what is our true nature. when the difficulties will be resolved and all will go well. Paul Brunton, Master Subramuniya, Swami Chinmayananda, and Seung Sahn. my protein paper became a "Science Citation Classic"
My research paper "Prediction of Protein Conformation" was published in Biochemistry, Volume 13, 222-245 (1974) while I was a postdoctoral research fellow in Professor Gerald D. Fasman's lab at Brandeis University. In 1981, I received a letter from Eugene Garfield, Editor of Current Contents. He mentioned that my paper has become a "Citation Classic" and wanted me to write an article on the discovery process that led to the work. It was a dream come true. I wanted to thank not only my scientific mentors that guided my research work but also the spirtual mentors that inspired me. But in the same week, I received a letter informing me that Paul Brunton had died. He was the British sage I had met in Switzerland on fourteen occasions (1972-1979). When he told me on our first meeting "I am not a guru. The guru is within you. ", I made my lab at Brandeis my garden of meditation. I looked at the 20 amino acids as my little friends. I purified my mind to be a child always in wonder of the beauty and miracles of the universe. In this spirit I was able to find a simple predictive method without recourse to computer computations that became widely used in the biochemistry community. I was overwhelmed receiving letters from Nobel Laureates asking for reprints of my papers and predicting protein structures for them. I was invited to Japan, France, and Germany to present research seminars and workshops. When Current Contents had a list of "Citation Classics" with papers by Einstein and Bohr, I couldn't believe that my paper was ranking up there with science heroes I'd worshipped since childhood. A paper is considered a "Citation Classic" if it had over 100 citations in a ten-year span (1971-1980). My Protein Prediction paper had 560 citations from 1974-1980. When I began yoga meditation in 1968 at Cornell and studying the philosophy of Plato and Oriental sages, I had some doubts about giving up desires and the ego of personal achievement for something as nebulous as cosmic consciousness and helping others to experience the empty mind of Buddha nature. Looking back, I can't believe the wonderful teachers and friends that came my way to help me in experiencing the peace of mind that's beyond all treasures. I never wrote the "Citation Classic" article but instead wrote a book of poems that week in honor of Paul Brunton and the time we spent together. I sent it to Kenneth Thurston Hurst, President of Prentice-Hall International. He was PB's only son and he thanked me for my momento to his father. When Professor Fasman passed away on December 17, 2003, I composed a web page for him Gerald D. Fasman on the Internet. While compiling some of our papers listed on the Web, I came across Fasman's article which he wrote in 1987. Around 1999, I received a letter from the San Francisco Arts Waterfront Project. They found my "Valentine Mints Poem" from A Tree in the Sky: California Poets in the Schools 1995 Statewide Poetry Anthology, and paid me $100 honorarium to cast it in bronze. I didn't get to see it in six years until August 5, 2005. My Valentine Mints Plaque is located on an island at the Ferry Terminal Trolley Stop near the Ferry Building in San Francisco. Sometimes in life we're not aware that a precious treasure has been given to us until many years later. I believe that Marcel Marceau's kind words to me and warm welcome instilled in me to excel in my work as a scientist as well as a poet in life. To this I'm truly grateful and have written this poem in his memory. Thursday, March 25, 1982, 8:00 p.m.